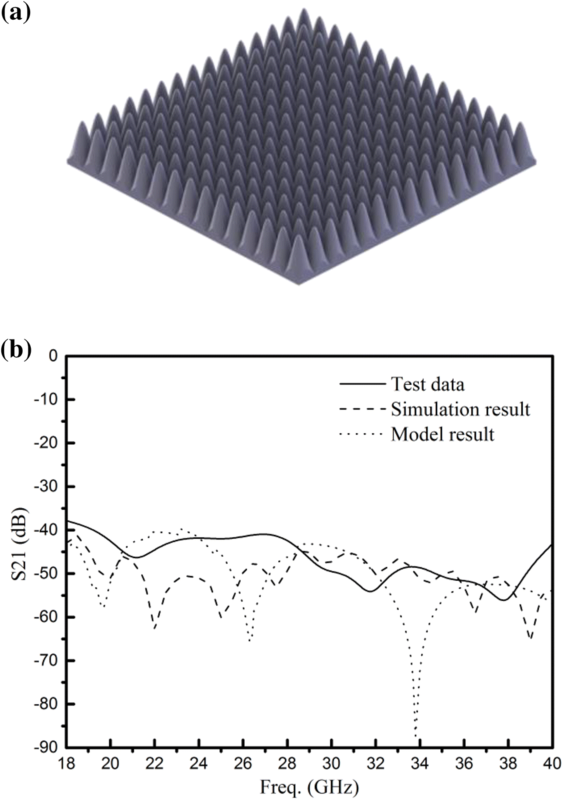 Millimeter-wave pyramidal absorber with working frequency from 18 to 40 GHz was developed in this study, which is suitable for anechoic chambers for 5G wireless terminal measurement. Since full-wave numerical method is a time-consuming process to optimize the performance of wave absorber, a theoretical model based on homogenization theory was developed for fast analysis of the reflectivity of absorber with arbitrary shape. In order to validate the theoretical model, absorbing performance was obtained by both theoretical approach and electromagnetic (EM) simulation, respectively. The effects of design parameters, like geometry and foaming ratio on the EM performance, were investigated. A 300 mm by 300 mm conical absorber made of carbon black-filled expanded polypropylene achieves reflectivity around − 40 dB to − 60 dB in working frequency band. The experimental results also prove that the theoretical solution can predict the performance of design with excellent accuracy. With the rapid development of communication technologies, the fifth-generation wireless communication (5G in short) will work in millimeter-wave frequency, such as 28 GHz or 39 GHz, to achieve high-speed connection. 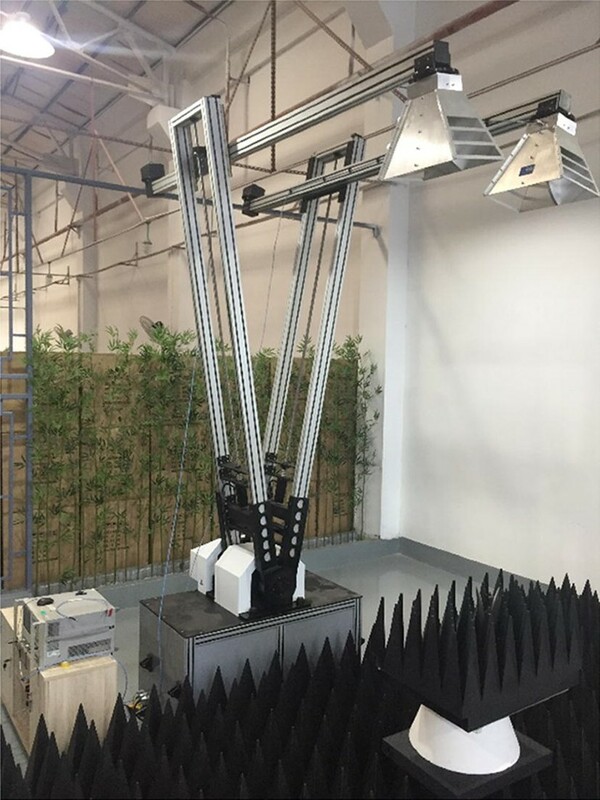 To evaluate devices under test more accurately, over-the-air (OTA) measurements need to be performed in anechoic chambers that provide noise-free environment . And the millimeter-wave chamber with low environment reflection depends mainly on the absorptive capacity of millimeter-wave absorber. However, it may take a large amount of computing resource to simulate the EM performance at millimeter-wave frequency, because of the short wavelength resulting in large simulation model in terms of the wavelength of working frequency. Therefore, it is critical to find a more efficient way to evaluate the performance of wave absorber. Theoretical model is suitable for optimizing design parameters and reducing development cycle. Many researchers have investigated theoretical methodologies of EM absorber for analyzing the influence factors in the last few decades. For example, Holloway and Kuester  developed a theoretical model in attempting to calculate absorption at lower frequency for EMC/EMI measurement. The methods of homogenization and Riccati formulas were used for theoretical model of wedge and pyramid absorber arrays. Fallahi and Enayati  made the efficient and robust analysis of absorber with R-matrix Fourier modal method and the mode matching of fields. Kubytskyi et al. addressed the fast optimization algorithms of homogenized equivalent structure. Préault et al. used dynamic homogenization method (DHM) to analyze shielding composite materials. 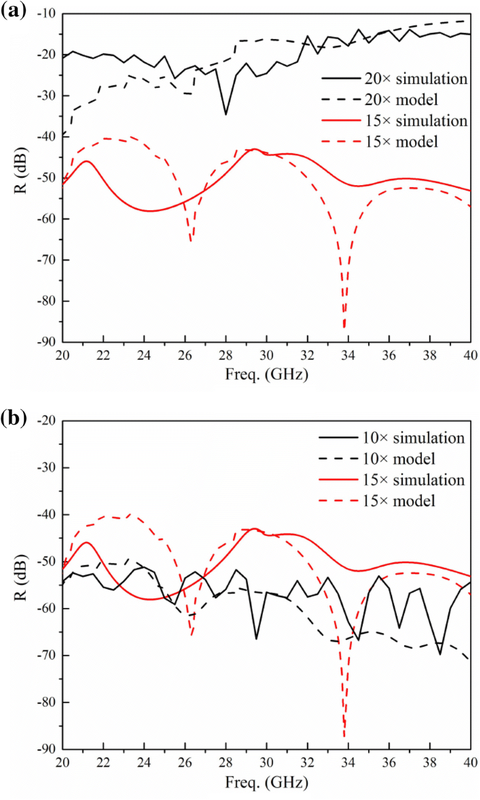 Even though numerical simulation was already used in high-power millimeter-wave absorber in the previous work , no reports have been found on the theoretical design of millimeter-wave absorber with gradient structure. 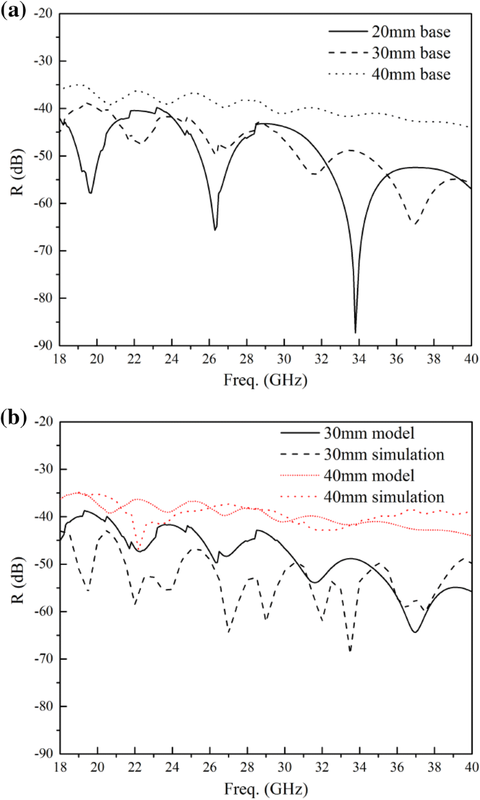 The reflectivity of millimeter-wave absorber was evaluated with homogenization theory in this study. Both theoretical analysis and EM simulation were carried out before verified by free-space measurement. The wideband EM absorber is a gradient structure facing toward the wave incoming direction. Hence, it is difficult to directly apply transmission line theory to calculate EM loss in absorber. Homogenization is a common method to establish the theoretical model, since transmission theory is applicable only after transforming gradient structure to multilayer planar structure. By mixing two or more media into one uniform medium, the reflectivity would be calculated from the mismatch between free space and the impedance of the uniform media. A typical structure of EM-wave absorber is illustrated in Fig. 1. Generally, cones of wave absorber are axisymmetric along z axis and arranged in x–y plane periodically. They can be considered as a vertically gradient structure. Moreover, it is backed by a metal plane at the bottom, to shield external interference signal. where εe is dielectric constant of the absorbing material, εi is the permittivity of air, f is the volume fraction of inclusions and εeff is the effective permittivity of the mixture. The relative parameter of absorbing material can be measured by free-space method from 18 to 40 GHz, and Nicolson–Ross–Weir method is applied to characterize the complex permittivity of materials. When the thickness of multiple layers is small enough, the error of the homogenization approach is mainly caused by the measurement of dielectric permittivity and loss. Test permittivity and loss of EPP material are shown in Fig. 2a. The noise of real and imaginary part of permittivity in Fig. 2a may be caused by the time-gating used in the free-space measurement. where η is the intrinsic impedance of free space and Zin is the input impedance of EM absorber. The input impedance is calculated starting from the bottom to the top, because metal backplane could be considered as short-circuit terminal. Then, the input impedance of the top layer is obtained by means of iteration. Once the input impedance Zin is calculated, the reflectivity of model will be obtained from Eq. (2). The reflectivity of absorber samples could be measured with free-space method initially developed by Navy Research Laboratory (NRL). Two L-shaped arms were employed in this work instead of arc to hold transmitter and receiver antennas . The measurement distance (from sample to antennas) is adjustable from 1.7 to 1 m. Large measurement distance was used when frequency is low or sample is large. Small distance (~ 1 m) was used when measurement frequency is in millimeter band. The measurement error of NRL method comes from the non-uniformity of sample, reflective noise from the environment and direct coupling between transmitter and receiver. The measurement error of current free-space system is within ± 2 dB when the measured reflectivity is around − 40 dB. Figure 3 shows the picture of the free-space system used in this work. A program is written with MATLAB to calculate the reflectivity of gradient absorber with arbitrary shape once the dielectric permittivity and loss, as well as geometric parameters of absorber, are given as input. A gradient absorber is designed in this part, using the method of the theoretical model and commercial FEM software. The targeting reflectivity is better than − 40 dB from 18 to 40 GHz. It could be achieved by properly optimizing variables, such as tapered shapes, base height and foaming ratio. The tapered portion of absorber has two effects. The first is to match impedance of absorber with free space, and the second is to make EM wave reflect between tapers. 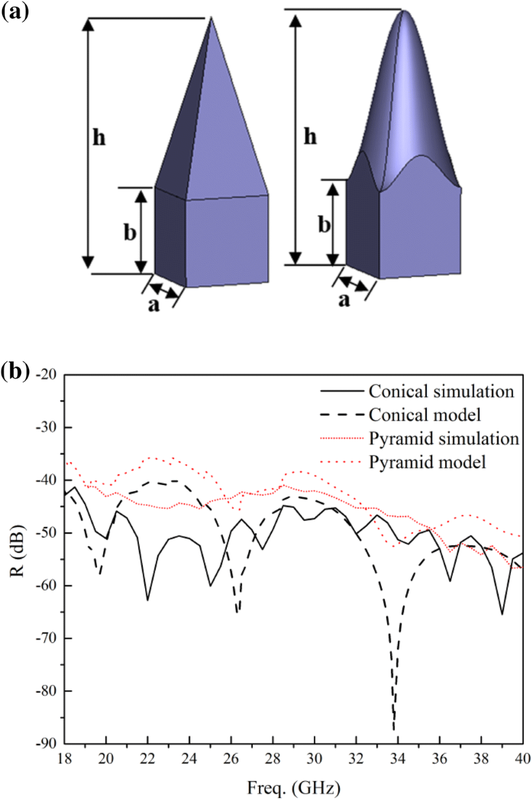 The difference between pyramid cone and conical cone is investigated in Fig. 4a. In order to be comparable, their volume is kept the same by adjusting the radius of conical cone, which means the weight of absorber is equal. Besides, dimensions of element are configured as a = 20 mm and b = 20 mm, and the height is h = 60 mm. Figure 4b shows the results of the reflectivity of absorbers with different structures, which is defined as the magnitude of the reflection coefficient in dB. These results were obtained using both numerical model and EM simulation, which are plotted in dash line and solid line, respectively. 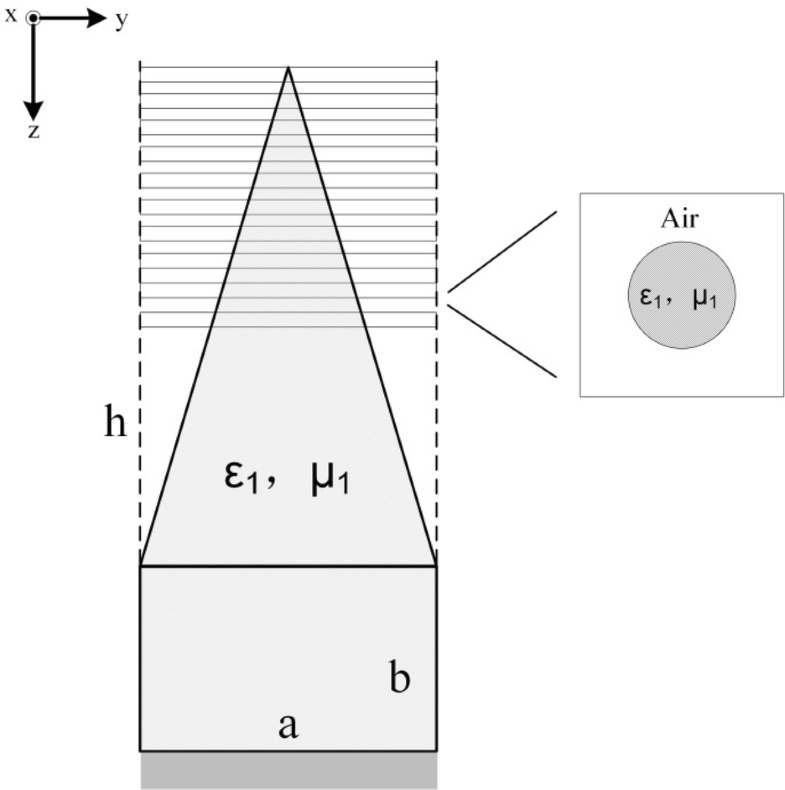 From this figure, it is apparent that the performance of conical absorber is similar to the pyramid one at high frequency, but it has better absorption at low frequency. It is worth noting that the dash curves have a good agreement with the solid curves in the same color. As compared to the numerical method, the theoretical approach can reduce the calculation time from hours to less than 30 s using the same personal computer. Because of the space limitation in anechoic chamber design, we pursue a better performance within certain height by optimizing geometry. Reflective curves indicate that conical absorber has better absorption than pyramid absorber with the same tip size and height of tapers. The second study is about the base height of conical absorber. The parameter b varies between 20 mm and 40 mm, while calculating the amount of change using theoretical model and EM simulation. As the base provides EM loss, variable b will change the height ratio of taper and base, which represents matching part and lossy part. Since the total height of absorber is fixed, the base height needs to be optimized to balance the ratio. Parameter optimization is carried out using theoretical model, and result is illustrated in Fig. 5a. It shows that conical absorber with higher base has worse reflectivity than the one with 20 mm base. Since the tapered portion is used for impedance matching, short cones will cause reflection before EM wave getting into absorber. Similarly, Fig. 5b shows the results from simulation in dash line, and we can find that results are close to the solid curve in the same color. Since the structural parameters are confirmed by the cases of shapes and base height of absorber, foaming ratio is another factor which may affect the absorption. As an important parameter that affect the product weight, on the one hand, higher foaming ratio can reduce the weight, on the other hand, it determines the gap of conductive carbon particles and the gross density, so that the complex permittivity of material will be changed accordingly. Hence, different foaming ratios are compared in order to customize on the total weight and absorbing performance. The results of 20 × and 15 × ratio are shown in Fig. 6a. It is found that the reflectivity of high foaming ratio is worse than that of 15 ×, which means that high foaming rate particles make less loss under the same carbon loading in each particle. By reducing the foaming ratio to 10 ×, the reflectivity of absorber will be lower than − 50 dB or even better (Fig. 6b). It is indicated that low foaming ratio makes high EM loss and better performance which is understandable. However, the lower the foaming ratio is, the higher the total density would be. To balance both weight and performance, foaming ratio in 15 × was chosen for experimental study. By changing the EM parameter of different foaming ratios, the method of homogenization gives the calculation results in dash line. The dash curves from Fig. 6a, b reveal the same trend with the simulated results in solid curves, which means that theoretical model solves the current model with good accuracy. Conical absorber with optimized parameters was fabricated to verify the accuracy of theoretical calculations. Millimeter-wave absorber which employs expanded polypropylene as matrix material and carbon black with size about 50 nm as filler was fabricated with two steps: foaming of single blended particle and molding of the cone absorber. The size of planar sample with periodical cones is 300 mm × 300 mm, and the overall height is 60 mm. A free-space measurement system was used to test the reflectivity of the sample which was illustrated in the previous study. Test sample and results are shown in Fig. 7a and b. It is found that absorber achieves the desired performance in full operating band. Good agreement between the test, the simulated and the theoretical can be found. The difference when R is below − 40 dB can be attributed to the environmental noise in the free-space measurement, or the numerical error in the FEM simulation. 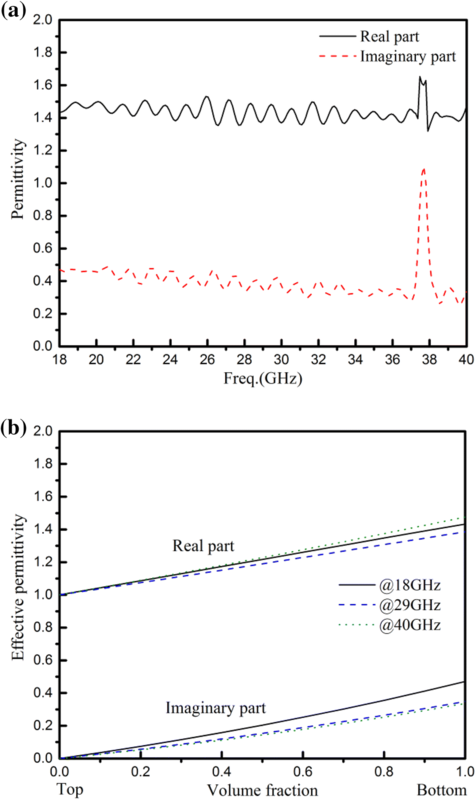 A millimeter-wave conical absorber for 5G anechoic chambers with reflectivity less than − 40 dB between 18 and 40 GHz was developed based on homogenization theory. 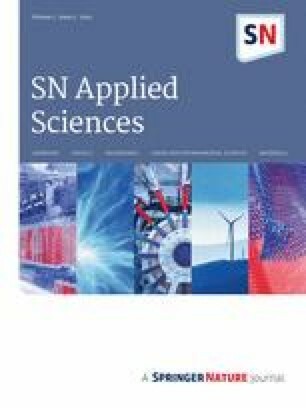 Compared to numerical simulation, theoretical approach demonstrates good accuracy but with much less computation time. According to the free-space measurement results, EM performance of absorber developed can meet the design target and has sound agreement with theoretical calculation. This work was supported by the National Science Foundation of China under Grant 61571433 and Ministry of Education China Mobile Research Foundation (No. MCM 20150101).